The road back starts here. 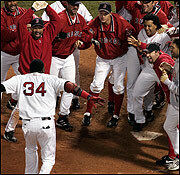 In one of the greatest games in Red Sox postseason history, Boston rallied to tie it in the bottom of the ninth against Mariano Rivera (sparked by Dave Roberts’ swipe of second — the biggest steal in Sox history), and David Ortiz won it at 1:22 a.m. (more than 5 hours after the game began) with a walkoff homer in the 12th inning. Dan Shaughnessy: Carlton Fisk in 1975. David Ortiz in 2004. Twelfth inning both times. Hold on to those tickets for this afternoon’s fifth game of the 2004 American League Championship Series. The left-for-dead Red Sox are still breathing.